This was one of the easiest cakes that I’ve ever made, and my husband paid me the compliment that it tasted better than the box mix version. Not as mountainous as the box mix, though. 1. Make the choux: Bring the water, butter, salt, and vanilla sugar to a boil. Add the flour and stir continuously until the contents of the pan are thoroughly combined and pull away from the sides. 2. Let the choux cool a little and then add the eggs one at a time. Stir until the mixture is smooth and shiny. Let dough rest. 3. While the choux is resting, combine the biscuit ingredients. Spread onto a baking sheet lined with baking paper and smooth it out. Bake at at 200 ° C (392 F) for 10-15 minutes. When the biscuit is done baking, chill it in the refrigerator. 4. Line a baking sheet. Brush the baking sheet with butter and sprinkle it with flour. Spread the choux pastry over it and bake at 220 ° C (428 F) for 20-25 minutes. Once the pastry starts to brown, reduce heat to 160 ° C (320 F). Do not open the oven during the first 15 minutes. 5. Make the filling: Bring the milk to a boil, then add vanilla pudding mix and sugar. Stir continuously until it thickens into a pudding. Add the gelatin and stir. Put the pudding in a bowl and chill until it is cool, but not solidified. 6. When the custard is cold, carefully whisk in the whipping cream and sugar a bit at a time. 7. Smooth the custard/pudding over the cooled biscuit, then place the cooled choux pastry on top of it. Dust with confectioner’s sugar before serving. The cake was in layers, and in between each layer was a thin spread of apricot jam. The cake was covered with a rich chocolate ganache and decorated with sugared violets and whole coffee beans. 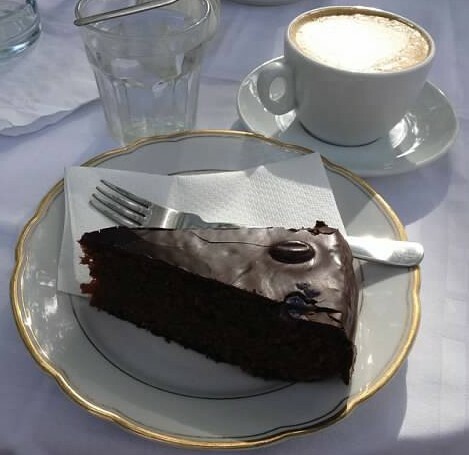 I love poppyseed everything and would like to re-create this cake at home but, alas, my husband is not a fan of either poppyseed or Austrian cakes. 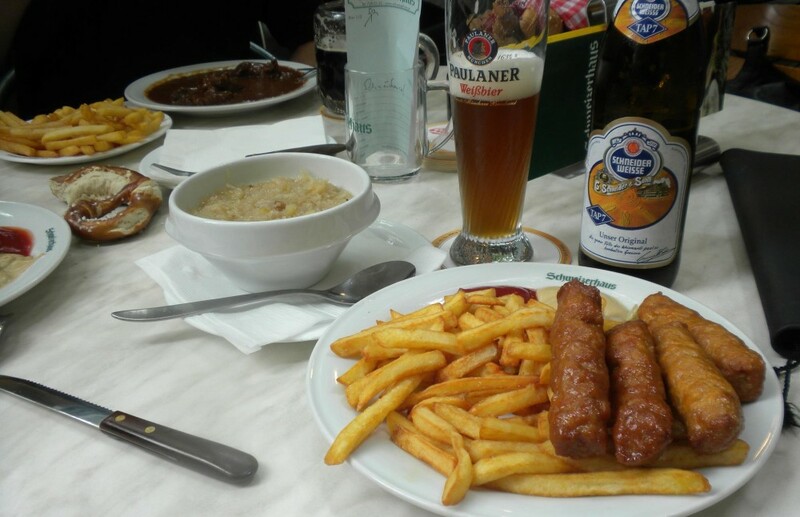 I will have to settle for looking at this photograph and drooling. 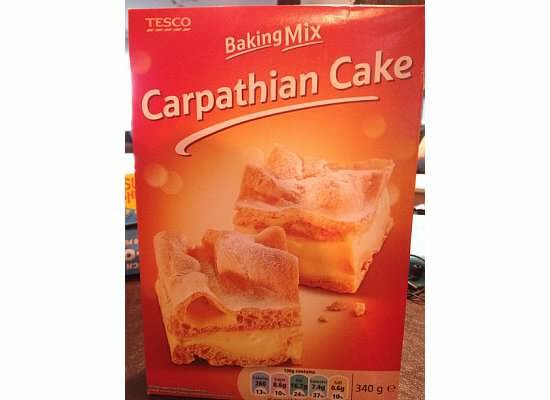 I normally don’t use box mixes for cakes, but I’d never heard of this type of cake before and the name “Carpathian” sounded dark and mysterious. Plus, the added ingredients were butter, eggs, milk, and more butter — can’t go wrong there. I don’t know whether the name of the cake is derived from its region of origin, or the fact that it looks like a snowy mountain range. Perhaps both? Regardless, this cake was delicious! 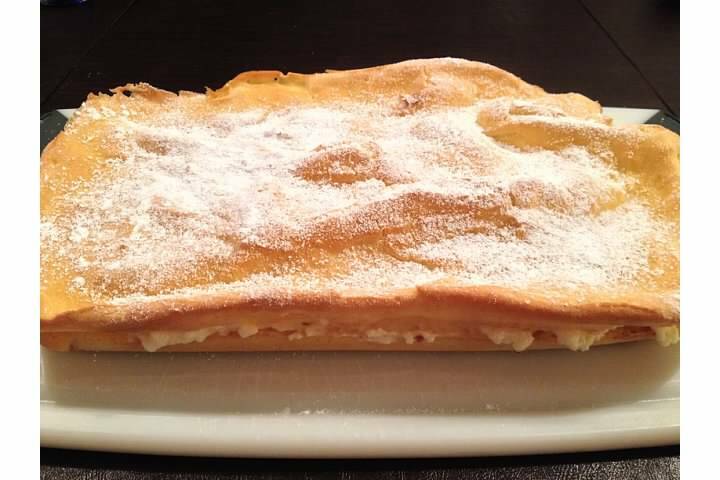 It tasted vaguely reminiscent of a Boston crème pie less the chocolate, or perhaps a plain/fruit-less Napoleon. I loved this cake and so did my husband. My daughter was convinced this was her birthday cake (it wasn’t), so she sang “Happy Birthday” to herself over and over as she inhaled her slice. Needless to say, this cake was a winner and I will research a recipe so that I can make it again. I am not going to lie — this is the most high-maintenance cake that I’ve ever made. It took me over three hours start to finish, and I spent at least half that time saying, “I am not going to make this cake again.” It didn’t help that the temperature was in the 90s and I was toiling away in our un-air conditioned apartment. The dough was literally sticking to, and perhaps melting onto, the (very well-floured) counter because of the heat. “I will break you.” — The cake. My parents arrived for a visit this afternoon and I served the cake for dessert, to unanimous and enthusiastic praise. 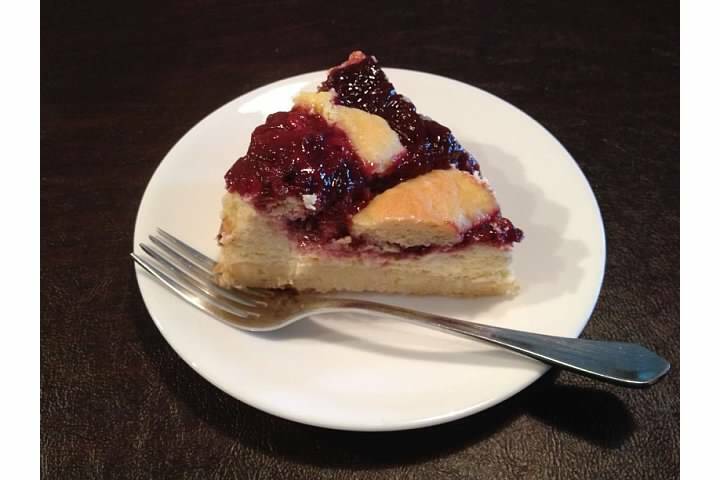 My husband specifically said he’d love to have the cake again with marillenroester in place of the powidl. So I guess I have to admit that perhaps the effort was worth it. 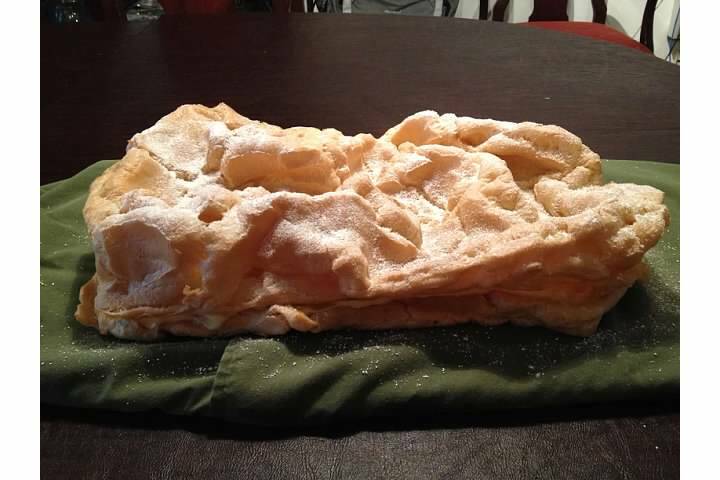 Plus, you can use the base recipe for the dough and filling and use whatever fresh fruit or fruit compote you want on top (in place of the powidl). 1. Preheat oven to 175C (about 350F). 2. Make the dough: Sift the flour, then put it in a food processor with the baking powder and butter. Pulse until the mixture is crumbly, then transfer to another bowl. 3. Add the sugar, vanilla sugar, lemon zest, egg, sour cream, and topfen to the flour/butter mixture. Knead quickly into a dough. Let rest for 30 minutes in a cool place. 4. Roll 2/3 of the dough out. Line the bottom of a springform pan with baking paper, then place the dough into the prepared pan. Pre-bake for about 15 minutes. 5. While the dough is cooking, make the filling: cream the butter with egg yolks and sugar until pale and fluffy. 6. Add all the other ingredients except the egg whites and cream. Beat until combined. 7. 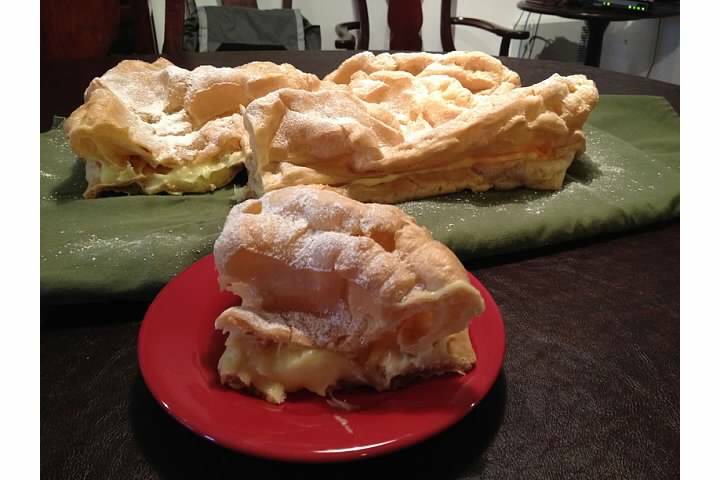 Stiffly beat the egg whites, then fold the beaten egg whites and whipped cream into the filling mix. 8. When crust is done pre-baking, let it cool slightly then evenly distribute the filling across it. Top with the powidl. 9. Roll the dough scraps and cut into strips. 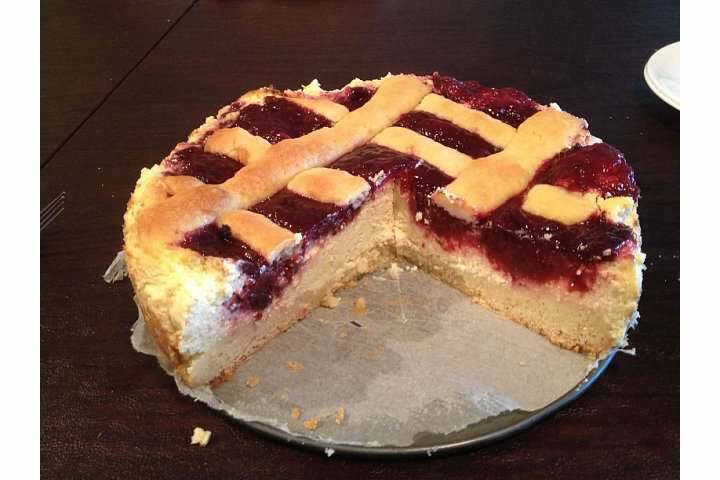 Use the strips to create a lattice over the top of the cake. Brush the top with yolk/milk mixture. Sprinkle with flaked almonds, if using. 10. Bake at 170 degrees for 50 minutes, or until done. Let cool completely in oven. 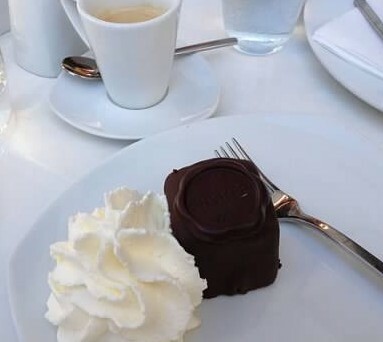 The Sacher Würfel, literally a Sacher cube. Not only was the cube a smaller portion of the cake, but it was completely enclosed in the chocolate topping that I enjoy so much. Brilliant.